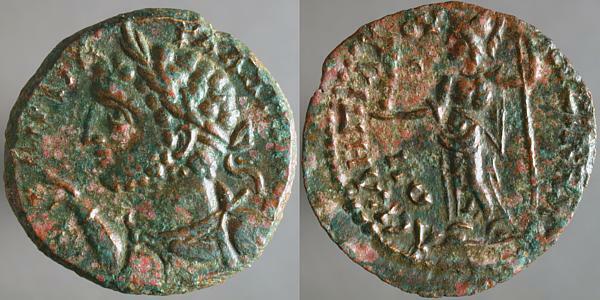 VALERIANVS NOBIL CAES, Bare-headed draped cuirassed bust of Valerian II right / PRINC IVVENTVTIS, Valerian II standing facing in military garb, head left, holding short scepter left and transverse reversed spear. Two standards right. I don't expect to be purchasing Roman gold in the near future: there are few bargains. Plaster casts, such as these, were once a common substitute for prohibitively expensive coins. These casts are from the estate of Peter Rosa (who is covered at length in Wayne G. Sayles's Classical Deception) and were probably prepared by the British Museum. The plate in the Göbl book also appears to be a cast, but one taken from a coin without the apparent hole or double-struck obverse. The hole does, though, add evidence that the two sides of the original coin were in 180° alignment. 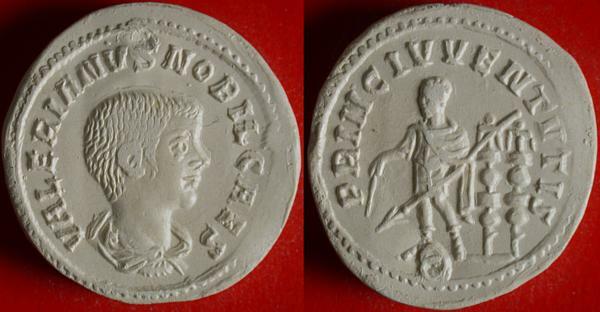 "Some of the large coins weigh over a pound and they cover the whole of the palm of your hand, about three inches across"
Via rogueclassicism, the Nottingham collection of Lord Savile's 684 Roman Republican coins has been cataloged. Lots of early cast bronzes. ΑVΤ[Κ Π ΛΙΚ]ΓΑΛΛΙΗΝ[ΟC], Laureate draped bust left, right hand raised / ΑCΚΛΗΠΙΑΛΟV ΚVΖΙΚΗΝ_ΩΝ, Athena standing facing, head left, holding Palladium left and long scepter right. 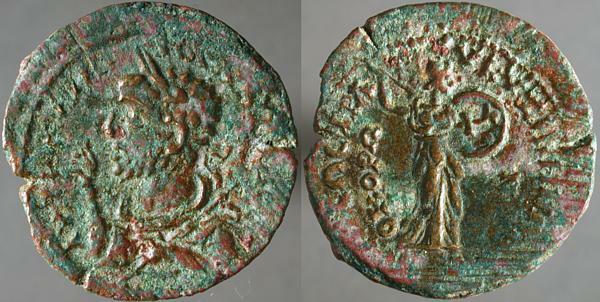 A different consular bust than Tuesday's coin, and a reverse naming a different magistrate, Asklepialos. 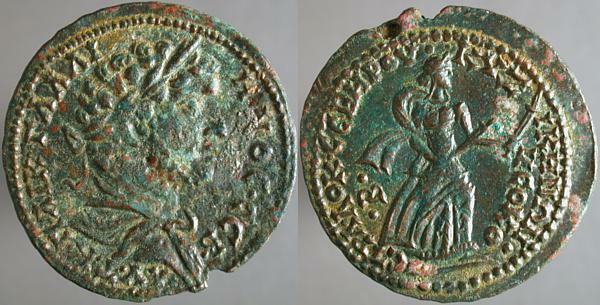 CORNELIA SALONINA AVG, Diademed draped bust right / IVNO REGINA, Juno standing facing, head left, holding scepter right and patera left. S_C across fields. The sestertius was the largest-diameter regular-production Roman coin, and is quite popular with collectors because of that size and the opportunity it gave the engravers for quality work. Those engravers did not, naturally, always take full advantage of the opportunity. For all that it's uneven though, I do admire the patina. Laureate head of Saturn left, O and pellet before, ROMA and harpa behind / Venus in biga right, Cupid flying above with laurel wreath; L·MEMMI / GAL in two lines in exergue. There isn't a solid consensus about why some issues of Republican denarii had these serrate edges. Counterfeit prevention is often proposed, but by no means universally accepted. Æ25, Cyzikus in Mysia, Gallienus, unpublished? ΑVΤ[...], Laureate draped bust left, right hand raised, transverse short scepter in left hand / [...]ΩCΠΑ_V ΚVΖΙΚ[...ΝΕ]_ΟΚΟΡΩ_Ν, Athena standing facing, head right, holding shield right, brandishing spear. The bust is a stylized image of Gallienus as consul, which office was the highest honor in the days of the Republic. Imperial Rome maintained a comfortable fiction that the institutions of the Republic were preserved under the leadership of the emperor, the first man of Rome, best suited to lead. This Principate persisted until Diocletian implemented a more openly regal style (still strictly avoiding calling it that) at the end of the 3rd Century that we call the Dominate. That, though, happened more than 15 years after the assassination of Gallienus, 15 years of near-chaos. GALLIENVS AVG, Radiate head right / PAX AVG, Pax seated left. In March, 2002, I bought a lot of uncleaned ancients that had, besides the usual late roman bronzes of Constantine and later, a dozen or so earlier coins with radiate-crowned emperors. After cleaning, I could see they were split between Gallienus and Claudius Gothicus, with this the best preserved of the bunch. 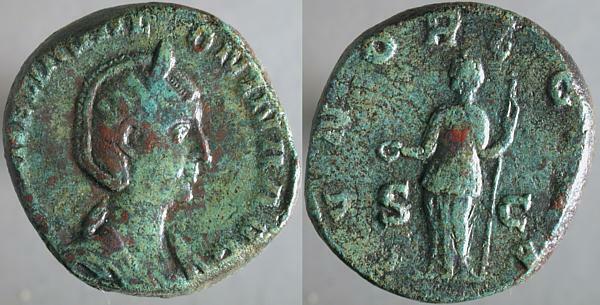 This coin was the impetus for me to collect Gallienus. ΑV·Τ·Κ·Π·ΛΙΚ·ΓΑΛΛΙ_ΗΝΟC·CΕΒ, Laureate draped bust right / CΤΡΑΛΟΚ·CΕΒΗΡΟV·ΚVΖ_ΙΚΗΝΩΝ· | ΝΕΟΚΟ | ·Β·, Artemis Phosphoros advancing right with a torch in each hand. 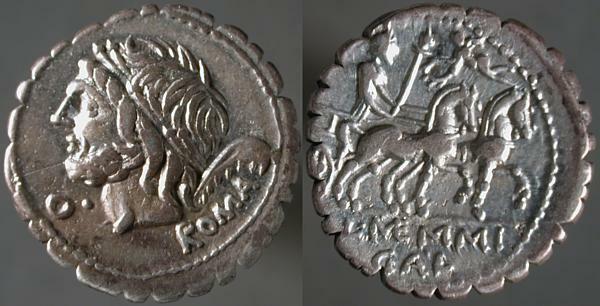 Cyzikus in Mysia minted imperial coins at the end of the reign. SNG Copenhagen 139 is similar to this, but names a different (and partially illegible) magistrate than CΕΒΗΡΟV (Severus?) named here.